Dyeing polyester/spandex slipcovers: what color should I use to turn orange to burnt orange? Unlike polyester dye, fabric paint can be applied without the high heat that damages spandex. Message: I have some orange slipcovers that I would like to dye burnt orange the fabric is polyester/spandex jersey. What color dye should I use? Choosing the color is easy. Choosing the right dye is the real problem. Polyester cannot be dyed in warm water. It can be dyed only at high temperatures. This means that, for solid-color dyeing, you must boil it, in enormous pots on the stovetop. You can't dye polyester in the bathtub or the washing machine. If you buy a large enough cooking pot to hold your slipcovers so that they can move around freely as they boil in the special polyester dye, the pot alone might cost more than sewing yourself some new slipcovers. Unfortunately, spandex is a very heat-sensitive fiber. It should not be exposed to temperatures over 140°F. It will stretch out and lose its shape, or fall apart, if boiled. This means that you cannot dye polyester/spandex blends. Polyester also cannot be dyed with ordinary dyes. If you try to use any dye that works on cotton, the dye will just wash out of your polyester, or rub off onto the clothing of whoever sits on the slipcovers. 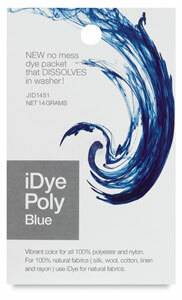 The only type of dye that works on polyester is disperse dye, which is sold specifically for dyeing polyester. Given these insurmountable problems, it's not much use for me to point out that you can turn orange to burnt orange by dyeing it with a small amount of brown dye, less than you would use to dye a white item brown, or with an even smaller amount of blue. What I recommend is that you buy some fabric and make new slipcovers. You can buy the fabric in the color you want; if you can't find the right color, you can buy dyeable fabric, preferably composed of natural fibers such as cotton or wool, then dye it yourself and make the slipcovers from that. If you don't want to sew, there are reupholstery professionals who can do this for you, although their work is usually expensive. It is possible, instead of dyeing, to paint the fabric with a good fabric paint that is labeled for use on polyester, but, when you use it on furniture, the paint will wear off long before the fabric wears out, and good fabric paint is not cheap. I don't recommend painting fabric furniture. If you want to do it anyway, look into a brand of furniture spray paint called Simply Spray.